Bentley, bay Hanoverian Stallion by (Belissimo M / Weltmeyer ), born in 2006, standing approximately 16.2 hands. This stallion has captured Hanoverian horse breeders’ hearts He is a textbook example of the perfect modern-day dressage horse: long-legged, beautiful type, full of presence and an excellent mover in any situation. Bentley has excellent basic paces, dynamic forward movement, a powerful hind leg action and an elastic back. This stallion has yet to meet his match! Bentley also has an impressive pedigree. He has inherited many of the qualities of his sire, Bundeschampion Belissimo M, whose offspring include champion mares, stallion performance test champions, Bundeschampions such as Bachus von Worrenberg and top priced auction horses. Belissimo M has a top breeding stallion rating of 169 and he is consistently making his mark on modern-day dressage breeding. The maternal grandsire, Weltmeyer, has earned his place in the history books for producing 148 successful advanced level dressage horses, including Olympic gold medal winners such as Weltall and World Cup winner Warum Nicht, eleven Bundeschampions, numerous top priced auction horses and over 90 approved sons. Great-grandsire Alonso provides Bentley with the rideability gene that he inherited from Akzent II. The dam’s line has produced both successful advanced level dressage horses and show jumpers. 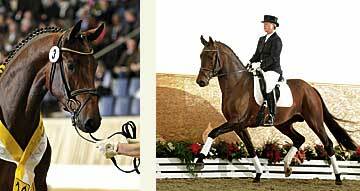 Bentley is an excellent choice for quality dressage horse breeding.